Last year I had a couple of experiences highlighting why social researchers suggest people are becoming disengaged and cynical about government, and also why people often say rude things about public servants. To me they are very powerful examples of organisational culture. 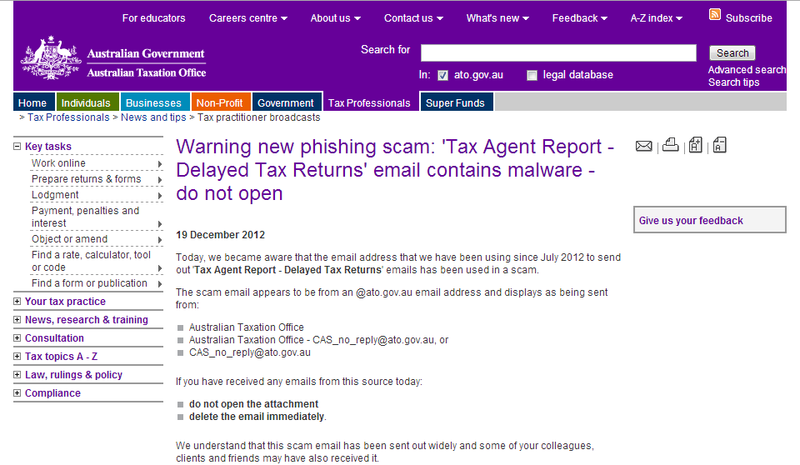 I recently received an email purporting to be from the Australian Tax Office (ATO). The email was well presented, with an authentic looking ATO logo and header, but a link in the email looked a bit suspicious, and I thought it was probably a phishing scam of some sort. So I decided to call the Tax Office to find out if this had come from them. Some of you will already be rolling your eyes, thinking that was a stupid idea on my part. And that’s sort of my point, we are so used to organisations like the ATO being painful to deal with, most of the time we won’t even bother, unless there’s some sort of threat of a fine or jail time. Even then, most people would rather pay an accountant to avoid having any direct contact with the ATO. The conversation bogged down when I pushed for an improvement on ‘almost certainly’. And this is where the cultural observation kicks in. This person had clearly been trained to rigorously avoid making any definitive statements about anything to a customer. Hedging was his default mode of communication. Should we be surprised at government staff behaving this way, when we see their bosses, politicians, do it every day in the media? How many people do you think die in Australia? According to the ABS, there were 143,500 deaths registered in Australia in 2010. That’s nearly 400 people per day. 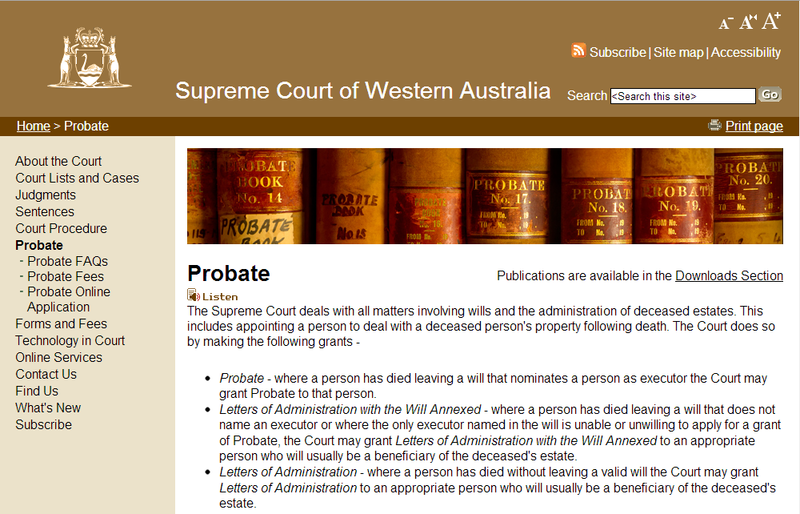 So you might think the Probate Division of the Supreme Court of Western Australia would be running like a pretty slickly oiled machine. After all, they are dealing with bereaved people at a time of loss. You might think they would have some well designed, finely tuned processes to minimise the hassles and stresses for people who are burdened with the sad task of managing the estate of a deceased loved one or relative? You might think they would handle this difficult task with a fair degree of empathy and sensitivity for their customers? Again, you might also think I’m an idiot for expecting such things from a government legal department? I won’t bore you with the details of repeated visits the office to lodge documents, asking the staff if I had completed them correctly, to be told “We don’t provide legal advice,” then having the documents rejected and again asking the staff for clarification on what was required, to be told “We don’t provide legal advice.” After a few rounds of this, the whole process takes on the quality of surreal, Kafkaesque parody. Whenever I encounter this sort of situation, I always wonder what it’s like for the people on the other side of the counter. Surely these people have experienced bad customer service too. Do they ever make the connection with their own work? Would they really like to do a better job, but they feel it’s not possible? If so, how does that make them feel? Again, the cultural observation: why do we accept or even expect an organisation like the Probate Division of the Supreme Court is likely to combine the worst of State Government bureaucracy and legal red tape to produce a culture with almost no focus on the needs of its customers? What are the leaders of these organisations doing to allow or encourage these cultural norms to thrive? What would it take to change them? If we, as customers, accept these cultural stereotypes as the norm, are we also tacitly condoning them? There was a very active discussion in the Linked:HR forum recently about the importance of salary in engaging employees. Lots of experienced HR professionals made comments to the effect that ‘money is not the most important motivator’. This idea is tossed around very freely, and there have been some studies to support it, but it requires a very important qualifier. I coached a person who was earning $250k and he went after a $150k CEO role in the nonprofit sector, because the new role was better aligned with his values. On the other hand, I’ve also worked with a guy earning $60k who quit a job because he felt undervalued, he and his wife want to have a family, and he needs at least $80k to support them. So – this is basic ‘Maslow’s Hierarchy of Needs 101’ – if you have enough money to take care of your basic needs, you can afford to think about other things, like self-actualisation. If you are in ‘survival’ mode, self-actualisation might seem like a distant luxury and money definitely can become your most important motivator. This means a ‘one size fits all’ approach to remuneration is unlikely to work for everyone in your organisation. When you think about engaging and retaining staff in your more junior or lower level roles, salary is probably a much bigger factor than it is for staff in your mid and more senior level roles. When you think about remuneration for staff in different tiers of the organisation, you might also want to think about how this impacts on their basic living requirements in different ways. ANSON offers a range of services to help you develop competitive remuneration and total employee engagement strategies for your organisation. If you’d like to discuss any of these in more detail, please contact me or visit the ANSON website. This week I couldn’t make Thursday night, so I went to the Tuesday night class instead. There was a very different group dynamic – the average age of the group seemed a little younger, and the teacher, Jonah, was also a younger hipster, with skinny jeans. Tonight we discussed the old hole in the sidewalk proverb. Synchronicity. As I sit here writing this, ‘Young Adult‘ is on TV in front of me (yeah, I know, who says men can’t multi-task?) and Charlize Theron’s character, Mavis Gary, is having a conversation with Sandra Freehauf (played by Collette Wolfe) about happiness. Mavis: It’s really difficult for me to be happy… and then for other people it just seems so simple. They just grow up and they’re so fulfilled. Mavis: I need to change, Sandra. Sandra: You’re the only person in Mercury who could write a book, or wear a dress like that. Sandra: Everyone here is fat an dumb. Mavis: Don’t say that… I mean you think so? Sandra: Everyone wishes they could be like you. You know, living in the big city, all famous and beautiful and all that. Mavis: I’m not really famous. Sandra: Well, you know, special or whatever. Some days when I have a slow shift at work I’ll think about you living in your cool apartment, going out and stuff. It seems really nice. Mavis: Yeah, but most people here seem so happy with so little. It’s like they don’t even seem to care what happens to them. Sandra: That’s because it doesn’t matter what happens to them. They’re nothing. Might as well die. This is the crux of the whole film. Happiness is relative, and Mavis has been looking for it in all the wrong places. In his novel, Player Piano, Kurt Vonnegut wrote, “a step backward, after making a wrong turn, is a step in the right direction,” and this is the essence of Young Adult. By returning home, Mavis is able to confront the event that sent her off the rails, reconnect with her youthful ambitions, and restart her path into adulthood. So how does this relate to the School of Philosophy? This week’s theme was self-knowledge. This is a big topic… Much of our experience of life occurs in the zone where ‘self’ meets ‘other’, or where ‘inside’ and ‘outside’ interact. The world stimulates our senses, exerts forces and pressure on us; while we also respond to those stimuli and exert force on the objects, people and ideas around us. If we only ever focus on what’s going on ‘outside’ in the world around us, and never have any knowledge of self, we’re only seeing half the picture. We imagine the world is always doing things to us, but remain blind to the things we are doing to put ourselves in that situation. One astute member of the class, Bec, pointed out the part that does not change is ‘I am’. As in: ‘I am not completely convinced…’ To me this feels like a cute word game, but I’m not sure if it tells us anything useful about the nature of the self. I’m not even 100% certain the self is a robust concept. Our sense of an enduring individuated consciousness is largely based on our memories linking together moments in time. But those of us who care passionately about growth and personal development will probably agree the version of ‘me’ that exists now is very different from the versions that existed in the past. So what does ‘I am’ really mean? ‘I am’ not sure I’m much closer to having an answer. But the conversation is fun, the other students are a lively, entertaining bunch, and the home made biscuits are delicious. Let’s see how week 3 goes. Many years ago a very old and dear friend from the UK came to stay with us for a while. During his stay we shared many excellent experiences and discussions, including one about ‘The School of Philosophy’ which he had attended back home. The principles of the school sounded fantastic. My friend told me about an organisation run by volunteers, where teachers are also students, and where all are encouraged to seek greater stillness and self-knowledge by applying techniques learned from various philosophies. I was very interested. I was also amazed to find the school had a branch here in Perth. I found it odd that anything so cool could be sitting on my own doorstep without me knowing. …until, last week, I saw an ad for the School’s ‘Introductory Course in Sustainable Happiness’. So I went along. I thoroughly enjoyed it. I’m going again this week. I’ve been telling people how great it was. And then I noticed something odd. On the web there are a number of sites, blogs, and discussion boards denouncing the School of Philosophy as a ‘cult’. The School is also hotly debated on Wikipedia. Much as I love Wikipedia, I’ve noticed from direct personal experience it is not a brilliant medium for handling and resolving contested or controversial subjects, and the debate is easily hijacked by a few passionate, misinformed people. After reading quite a few of these pages, many of the complaints are vague and unsatisfying. They fall into a few main categories. I found lots of posts claiming the School is a cult, from people who have never attended any classes at the School, and who’s opinions are based entirely on comments made by other people on other websites. Nearly all these comments draw their evidence from a very small number of sources. It’s hard to check these original sources, as most are no longer active on the web, and one is a book, written as an ‘expose’ by a pair of journalists. I could search out a copy of the book, but I’m not sure how reliable it would be. I found lots of posts (often anonymous) from people stating they attended some classes and ‘something just didn’t feel quite right’. This kind of comment is so downright unhelpful, it says more about the person making the comment than about the thing being commented on. There are a number of what appear to be credible comments from people who identify themselves as former students of the school, saying sometime around the second or third year of study they were asked to perform an ‘initiation’ ceremony, kneeling before a picture of ‘the Shankaracharya’. So, while my suspicions have been alerted, I’m not completely convinced. Are these a bunch of nice, well-intentioned people, being treated with suspicion because they’re misunderstood? Or are they loony brain-washers coming for me, my money, and my family? So, what was the first week of the course like? It was fun. We went through the main aims of the course, and the relationships between philosophy, wisdom and happiness. I also enjoyed meeting my fellow students. One lady told me she’d previously started the introductory course and been unable to finish it, partly because the whole School of Philosophy reminded her of a church group. She was referring to a certain dagginess about the interior decor, and the way everyone was dressed. We discussed the qualities of wisdom, using three very cheesy, well worn examples as a guide: Nelson Mandela, Mother Teresa, and Ghandi. Yes, these are certainly cool people who’ve achieved amazing things over the course of their lives. But is that really the best we could come up with? It smacks a bit of ‘coffee shop philosophy 101’. Yes, the Dalai Lama also received a mention. More to the point, I really know very little about any of these people, and I suspect no one else in the room did either. They exist in the popular imagination as iconic, semi-legendary cultural memes. The other thing these four have in common is the endurance of extreme physical hardship and/or poverty and/or exile in their dedication to a particular cause. Right now, at this present moment in my life, if I went home to my family and told them I was giving up everything I owned to follow my vocation and change the world, I not sure they would say I was ‘wise’. What would a wise person do? If we accept these assumptions and agree we have the capacity for wisdom, it’s hard not to wonder what’s stopping us from being wise all the time? The second piece of homework was an exercise to focus our attention in the present moment. This exercise is named, rather prosaically, ‘The Exercise’. The School of Practical Philosophy in (the equally prosaically named) Pleasanton, California has an audio recording of the Exercise on its website. Our homework is to complete the Exercise twice a day, preferably morning and night. So far that’s been going well. I’ve found it very effective. This is really what I signed up for. In my current situation, running my own business, with multiple projects and demands on my attention, it often seems like my mind is running at a million miles an hour, all the time, and it can be hard to turn it off. I know I’m not alone. In the course of my working and social life, lots of people have told me they have so much to do, with so little time, they are feeling stretched and they’re losing sleep. I’ve found the Exercise has helped me so far, and I think my family are noticing a positive difference. So far, I don’t think anyone has tried to brainwash me. Of course, if I have been brainwashed already, I might not know it. I’ll let you know how week 2 goes. Back in the old days, taps used to come in pairs, one hot, one cold, and they used to have washers inside that would wear out every few years, so you’d have to go down to the hardware store, buy a new washer for about 10 cents, and replace it. This was a real drag. Now we have gleaming chrome mixer taps, designed in Europe, and the boring old washer has been replaced with a ‘braking unit’ that comes as a sealed unit that’s guaranteed for 15 years. When the braking unit breaks, and your tap starts dripping, you have to order a new unit from the supplier in the Eastern States, who wants a proof of purchase for your 14 year old tap. More than a week later the part arrives and you follow the instructions to remove the old unit, which is so solidly wedged in place, with a rubber ‘o’-ring, the unit snaps in half, leaving a big chunk of ceramic and plastic stuck in your tap. You use pliers, monkey grips, bent coat hangers and wire to try to get it out. Nothing works. Eventually you drive screws into the plastic, so you can get a grip with the pliers, and finally you pull it out like a crumbly cork from an old wine bottle. Then you finish fixing the tap.